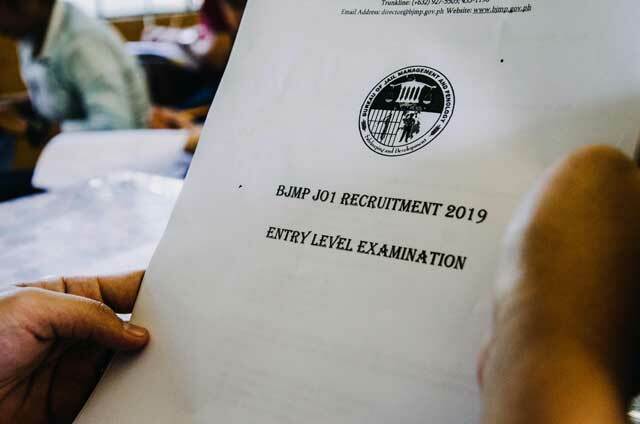 The BJMP conducts the Entry-Level Examination (EnLEx) to qualified applicants who want to become Jail Officers in the jail management bureau of the DILG. Passing the EnLEx means the chance to advance to the next step of the recruitment process. However, passing the EnLEX is not enough to land you the position. You have to get the best score possible to outrank your competitors because it has the highest percentage points (60%) in the final deliberation computation. Thus, we created this free online EnLEx reviewer to help you achieve this goal. It will help you prepare for the exam and give you the needed exposure to the actual tests you will take. Do not be late. The preliminary activities (registration, seating arrangement, etc.) will start on or before 0800H. It is to your advantage if you are able to accomplish the preliminary activities early. This makes you feel more confident in answering test questions. Wear a white plain shirt and maong pants. Examination proper will start at 0900H and end at exactly 1100H. You will no longer be allowed to take the exam if you will be unable to register and be at the venue at 0830H, regardless of any reason. On the examination day, you must bring one (1) piece passport size picture with name tag, a valid identification card, a pen and a pencil. Immediately look for your respective examination area posted at the main door of the exam venue. Do not bring any object other than pens and pencils to be used during the examination. Personal belongings shall be placed in front of the examination area. You are not allowed to use calculators or other aide/instruments in answering the test questions. Put off your communication devices to avoid undue distraction. Before the test proper, you shall accomplish the Examinee Attendance Sheet. You are not allowed to leave the examination area once the test proper has started except for compelling reasons. In such an instance, you shall be accompanied by the Proctor. You are required to remain on your seats even after you have finished the exam. Wait for the time to end for the simultaneous submission of questionnaires and answer sheets. Failure to surrender the Questionnaire and Answer Sheet will result in the cancellation of your examination and disqualification of your application.